The move by NPE, the International Plastics Showcase, to the Orange County Convention Center in Orlando, April 1-5, from Chicago—where it has resided for 40 years—has paid off. The event, held April 1-5, attracted an estimated 16,000 visitors, representing a 16 percent increase from the year prior. Orlando was able to convince NPE to make the historic move by concentrating on a “value proposition” combining the ability to handle a show of the magnitude of NPE, with the attractions and location able to draw quality buyers, Gary Sain, president/CEO of Visit Orlando, tells EXPO. Visit Orlando successfully landed SPI’s business by “due diligence—working through reams of information and analysis,” Sain says. Of most importance to SPI’s board, Sain says, was the “huge, and powerful, cost advantage” of moving the show. The end result was a successful show that attracted as estimated 16,000 visitors, representing a 16 percent boost in attendance. 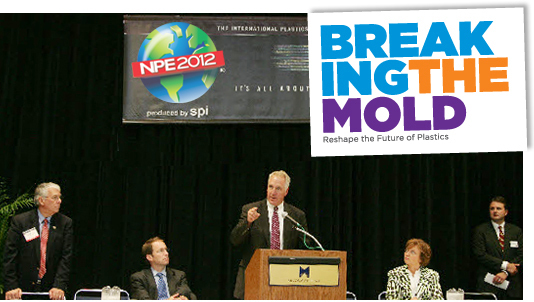 With plastics vital to so many industries, NPE 2012 attendees wield $100 billion of purchasing power, Sain says. Also of particular note: The Orange County Convention Center was able to readily truck in the four-story-high machinery that some of the 1,900 exhibitors showcased. In fact, the show had “close to 20 million pounds of working machinery—close to 22 fully loaded Boeing 747s,” according to SPI. Orlando’s convention center could handle it all, Sain says. As a result, exhibitors were able to set up within their scheduled time, and have ample energy to then man their booths effectively, he says. Compared to the NPE 2009 event, “what is amazing is the exhibitors’ energy level is so much more prominent on the floor, because they didn’t have to work until midnight in the three days leading up to the show,” Sain told EXPO on a call from the show floor. The other key factor in hosting a show in Orlando, Sain adds: “Orlando is becoming the gateway to South America. Orlando is a well-known brand and held in high esteem in South America. We attract 500,000-600,000 Brazilian [leisure] travelers a year—and it’s double-digit of that for business travelers from Brazil. Exhibitors at NPE told me they saw incredible new interest in South America at this year’s show, and made a lot of sales on the show floor. “I am sure the final numbers will show a nice contingent from South America drove NPE 2012 sales,” Sain says.